Yesterday, we mixed work and pleasure at Nellis AFB. 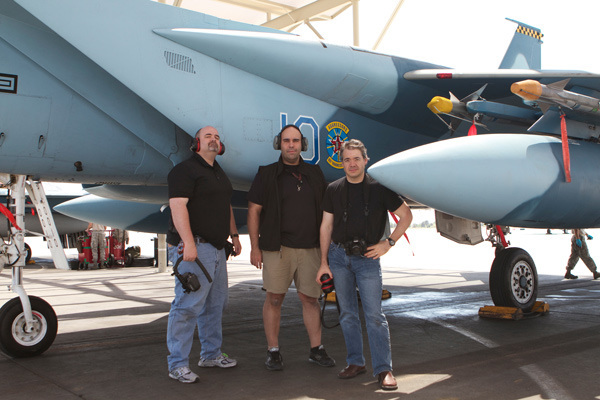 It is not everyday that one gets to touch and photograph F-15s. Walking on to the flight line, I heard the theme from Top Gun playing in the back of my head. In addition to shooting the F-15 Eagles, we saw the F-15 Eagle, the A-10 Warthog , the B-1 Lancer, the V-22 Osprey, and the F-22A Raptor. On the flight line, we saw most of these taking off or landing. It was pretty amazing. In between shoots, we visited the Nellis AFB “petting zoo”, a threat identification museum, which was recently declassified. It is a huge collection of captured assets, including a MIG-23, a MIG-29 and a bunch of tanks, missile systems and other huge, intense hardware. I kept waiting for Optimus Prime to rise from the mix. We were shooting for a defense contractor with offices on base. We’ll probably be back to get additional footage over the summer. All of the footage and stills are to used in promotional materials for the company. Nothing we shot was classified and we are allowed to release the material. So, look for more images from everyone on the shoot soon. I am sure mine will be the worst of the bunch. I have so much to learn, but that is what an internship is all about! Thanks to Alex, Richard Harrington and our hosts, Neil Henderson and his father, Earl “Obi-Wan” Henderson. That sounds amazing. Were you guys shooting any video with DSLRs? Which bodies? Looking forward to seeing some the images! * I am not certain that this is what Richard was shooting with. Will try to get confirmation. Wow – takes me back, I was stationed on Edwards Airforce Base – a long time ago, the A10, F15 , F16 and the A1a, & A1b were test birds – and cameras were verboten! – big time. The only thing you didn’t get was the space shuttle! Good work and have fun!